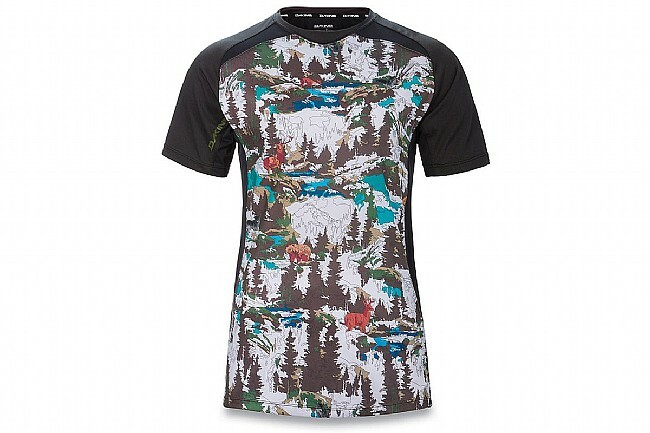 A lot like a superhero cape, the lightweight, tech-supported, and comfortable Men’s Charger Shortsleeve Jersey by Dakine will empower you to charge ahead and rival your enthusiasm for the trail with your speed. The Charger Jersey features a crew neck and relaxed fit for a stylish sporty look. The extended hem and interior sunglass wipe make the jersey particularly versatile. On the front, back and sides of the jersey, there’s 4-way stretch mesh paneling that facilitates ventilation and freedom of movement. To enhance comfort and prevent chafing, the jersey features flatlock stitching. On the technical side of things, the Charger Jersey features two remarkable technologies built into its quick-dry recycled polyester fabric: Channel Flow and Polygiene Odor Control. Channel Flow helps keep you dry and cool by transferring moisture from your skin to the fabric where it evaporates quickly. Polygiene Odor Control kills bacteria-causing odor with an active ingredient made from recycled silver, so you can confidently declare that it’s not you with the B.O.